Home » Foto-Friday , photography » Foto Friday: Albino Pigeons? I haven't done much photography since I fell sick, but saw a rare sight today that reminded me my phone still had a working camera! This pair of white pigeons! Yupp! 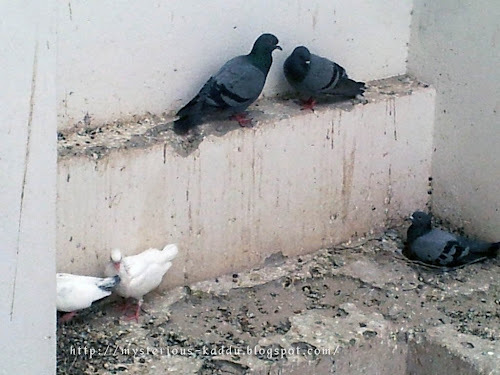 They were perched on the ledge below the kitchen-window of my next-door neighbor in the building, and I have no idea how they turned out to be white when all the rest of the pigeons in my area, including the parents of this pair, are gray! I couldn't get both the pigeons completely in the frame, because as soon as they saw me take my phone out, they started edging towards the column (on the left in the picture). I thought perhaps they were camera shy, but, then I realized they have a nest, full of eggs, in the corner behind that column! So their protective instincts had apparently kicked in! Will try to get a better shot some other time. Oh and all credit for the fantastic state of that ledge (and the wall behind) goes to... (yes, you guessed it!...) multiple generations of these wonderfully destructive pigeons! The dodo bird was a type of pigeon, did you know? And we only have ourselves, mankind I mean, to blame for the Kabootar Katastrophe we find ourselves in. Pigeon meat, called 'squab', was a hugely popular source of meat across much of the known world up till the 19th century. Millions were bred for food and thousands more as carriers of messages. With the advent of radio communication and the rise of chicken breeding, millions upon millions of pigeons locked up in cages around the world were released into the skies in the late 1800s and early 1900s, dramatically increasing their concentrations around human habitats as the domesticated birds never went back to the wild. The birds in your picture are descendants of pigeons liberated by irresponsible poultry farmers and courier services a century ago. What puzzles me is what made pigeon breeders release the birds. Why didn't they just sell the birds for consumption and halt further breeding? Why waste stock you've spent money breeding and raising? Also, what caused the sudden jump in the popularity of chickens? Why couldn't both squab and chicken be in the market? Why isn't pigeon flesh used for food now? They're all over the place. Grab at nothing outside your window and chances are you'll pluck a pigeon out of thin air. What puzzles me even more is "how come you have space in your mind for so many useless questions"! When The Heavens Opened Up!